The Spoken Tutorial Project is about teaching and learning a particular FOSS (Free and Open Source Software) like Linux, Scilab, LaTeX, PHP & MySQL, Java, C/C++, LibreOffice etc. via an easy Video tool - Spoken Tutorials. Some of the salient features of SELF (Spoken Tutorial based Education and Learning through Free FOSS study) are as follows. It is well known that seeing and hearing someone explain a process greatly improves understanding. So a variety of spoken tutorials will help a student to learn and use open source software.This also conduct software training workshops using spoken tutorials and give certificates to those who pass an online test. 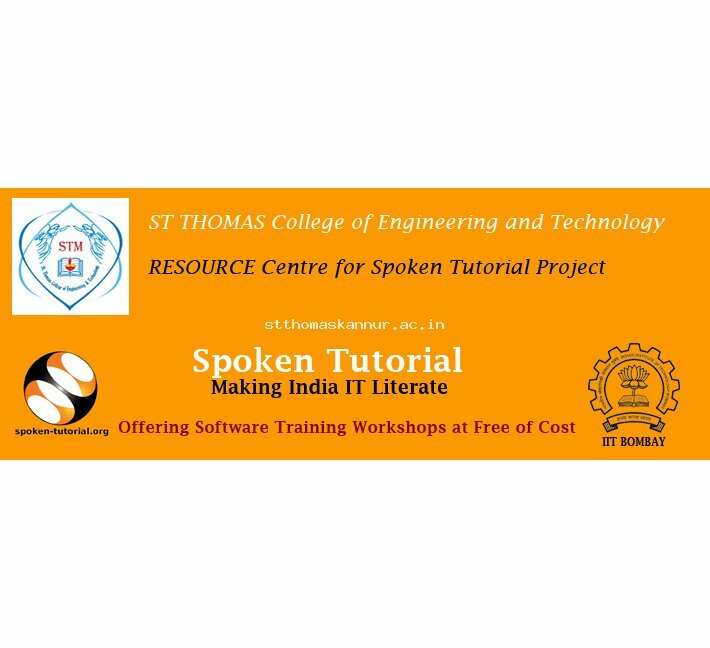 The Spoken Tutorial project is the initiative of the ‘Talk to a Teacher’ activity of the National Mission on Education through Information and Communication Technology (ICT), launched by the Ministry of Human Resources and Development, Government of India. The use of spoken tutorials to popularize software development and its use will be coordinated through their website. All the students who attended the spoken tutorial exam from first year CSE qualified the exam. Out of 43, eight students qualified from CE. From ME 2 out of 25 students qualified the exam in their first chance itself. Total 32% passed in Spoken Tutorial exam of first year. 24 Studebts from S4 CSE has successfully completed C test organized at St.Thomas College of Engineering and Technology,with course material provided by the Talk To A Teacher project at IIT Bombay. 16 Students from s2 CSE has successfully completed Python test organized at St.Thomas College of Engineering and Technology, with course material provided by the Talk To A Teacher project at IIT Bombay. Passing an online exam, conducted remotely from IIT Bombay, is a pre-requisite for completing this training.